Products in this category are designed to coat the surface of the stone to provide a glossy protective barrier. Impregnating granite sealers seep in without adding any additional gloss or shine. Granite Sealers in this category are designed to seal and bring out the color of the stone by darkening it in the same way that getting it wet would. How often do granite countertops need sealing? Unless you’re a world-class chef cooking 7 nights a week with high kitchen traffic you don’t need to seal your stone more than once or twice a year. We recommend using a granite sealer every 6 months. If you do see that your granite is absorbing water, it is time to apply a sealer. With that in mind – here’s a guide to sealing your countertops. You don’t want to seal in the dirt, residue and bacteria do you? No, you do not. Make sure to use a product that’s safe for natural stone. If you’re unsure what works, check out this post. 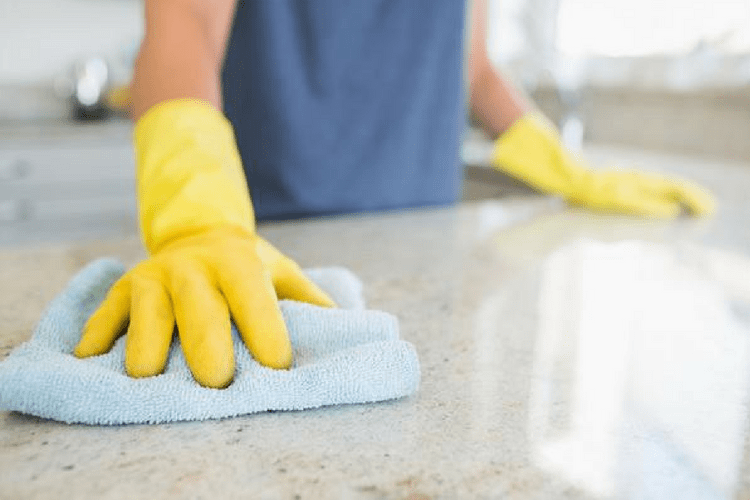 Ideally, there are some pretty good instructions on the bottle – but the general process will involve spreading the product over the surface of the granite and allowing it to cure. In some cases, the manufacturer will recommend a second coat. Step three: There is no step three. That’s it – sealing stone is as easy as wipe on and wipe off. To test the integrity of the barrier simply place a drop of water on your counter for 30 minutes and then wipe away. If the stone underneath hasn’t darkened then your counters are sealed and you can begin enjoying them! Do you seal your granite countertops? How often do you do it? Tell us in the comments below! Your article is really very good and i have bookmarked your website for the further update. Really very nice post, I appreciate. Your post is helpful for everyone who want to know how to seal granite countertop. Thank you so much for sharing this information with us. A very good blog post and thanks for sharing it with the community! This information will be really useful to seal granite countertops and I often do it.